Hump day hilarity – astronauts rule | Watts Up With That? Time to bring him back down. ← Nanocopper CO2 catalyst – a possible solution to EPA's draconian coal power plant killer laws? It’s high time we left Mr. Hansen. Now that Drudge has picked up the Astronaut story, it IS big. Hopefully, this will serve as a wake-up call for millions of people. Somehow, I doubt it will, but hope springs eternal! 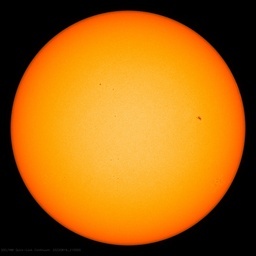 Get NASA back to being the best damned scientific organization in the world! And quit with this ignorant, superstition driven carbonphobia! warming up there….). Whatever were they thinking??? As always, great cartoon Josh! Love the cartoon but I say leave him up there. “Skeptics bay for famed climate scientist’s painful death” – free tweet for you there, Bob. The Moon is a paradise for this clown. There is no carbon dioxide there at all. Gosh, how about a space ship sending him to Venus with our hero astronauts at mission control. You could call it “Mission Acomplished” at least for him anyway. That hat’s not going to be much good upon re-entry. If Hansen is really worried about carbon footprints, why didn’t he just ask them to mail his award to him? Better yet, why didn’t he ask them to fax him a virtual award, which he could then print out and hang on his office wall rather than travel halfway around the world to pick it up? Is It just me or does it sound counter productive to destroy the planet to pick up an award for saving it? I disagree, That hat will make anyone look good during reentry. Like the reflections on the face “shield”. I always like Josh’s work, even if I don’t jump in and say so every time. It has been a tough day. Thanks for the laugh Josh!!! Of course, astronauts are supremely qualified to comment on Climate Change. To avoid confusion for those not familiar with UK traditions, the following distinction may be useful. ▪ The Duke of Edinburgh Award is given to teenagers who have demonstrated the ability to live in a tent for a year living off survival rations and to help the poor. ▪ The Edinburgh Medal is given to pensioners who have demonstrated the ability to live in a hotel for a year living off the minibar and to harass the poor. There are serious people that think Hansen is almost insane, but I disagree. 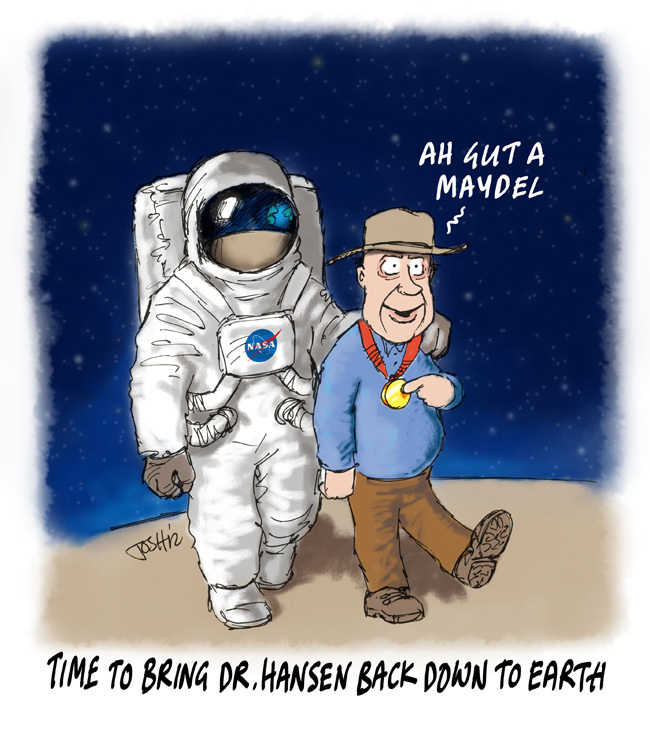 My preferred cartoon would be of an angry looking Hansen with his ‘tin medal’ (a military term for a worthless or unearned award) glaring at the spacesuited astronaut and saying “I got a medal for what I do. What have you got to show for what you did?” As the catastrophists live in a world where they are ‘heroes’ in their own minds and to each other they no doubt think that those who train for years then go to to Moon are on a doddle and not in their league. They are right, but not how they believe as they are lowly termites in a land of brave giants. Shhh! Don’t tell anyone it might ruin your attempt at sarcasm. Climate scientist, al gore, still finds it funny though. As a Scotsman I have to say I am embarrassed by this country giving a medal to this guy. It should be noticed, to their credit, that the Universtiy of Edinburgh is not listed as supporting this jamboree. But the City of Edinburgh Council is listed, which tells you everything. The original plan was to build a network of lines and the total cost was estimated at £300 million ($465m). After several years of delays work is still going on and today the estimated cost is £800 – £1000 milion ($1240- $1550m). And that is only going give them one line, not a network. And not even a complete line as it will stop short of its original destination, which was the main justification in the first place. This is the scandal in Scotland just now. The Council people had no project engineering expertise and they have no other scientific expertise. and this is the quality of the people who are giving out medals and spending taxpayers’ money for a lavish ceremony. As this story shows it was gullible people, whose only knowledge about climate comes from reading the newspapers and watching TV, who made the decision to nominate Hansen. The Government agency which also supports this jamboree has to go along with government policy – or they are fired! I don’t see that as a great honour! Perhaps the Warmists do. Next he’ll be babbling “A Mann’s a Mann for a’ that” (a bard of no regard?) considering he was in Edinburgh (didn’t think they had anything approaching warming up there….). Whatever were they thinking??? The words to the song “Is there for honest poverty” were another Burns composition, and the song was set to bagpipe music in the mid 19th century. Previously, it had been a marching tune for the fifes and drums. This tune is traditionally played when an accused soldier is brought before a summary trial, court martial or other hearing. By tradition, the accused removes his hat and is escorted in by two soldiers of equal rank – his peers – and is permitted to have a piper play him in. The tune is played to bring to mind Burns’ words – and remind the presiding officer that the soldier is still a man, and should be treated fairly and without prejudice no matter what the accusation against him might be. The tune is played by a solo piper. I would gladly pipe him in to a court martial! We learn that conservation of angular momentum knows to respond differently to “temperature changes that occur naturally and those caused by human activities”. Apparently physical laws got the memo. Has he worked out how to peel the foil off the medal to get at the chocolate? Who`s the guy in the NASA outfit – Geoffrey Boulton? Shouldn’t that caption be “ah gut a mohdel!”? Am I the only one who finds Josh’s cartoons a bit….